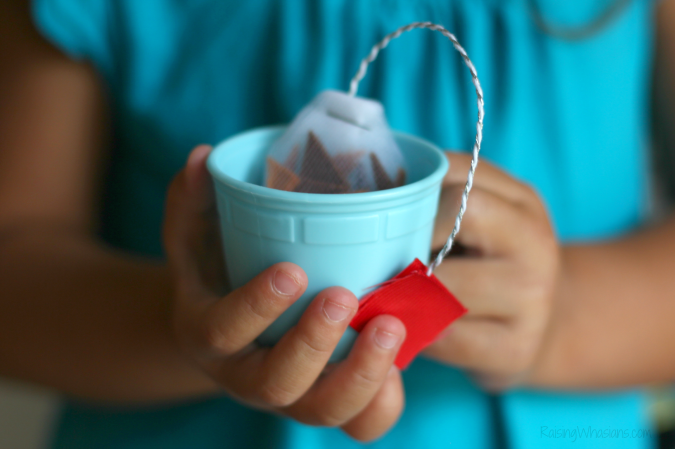 Help your child throw the fanciest tea party EVER with this No Sew Play Tea Bags Tutorial. 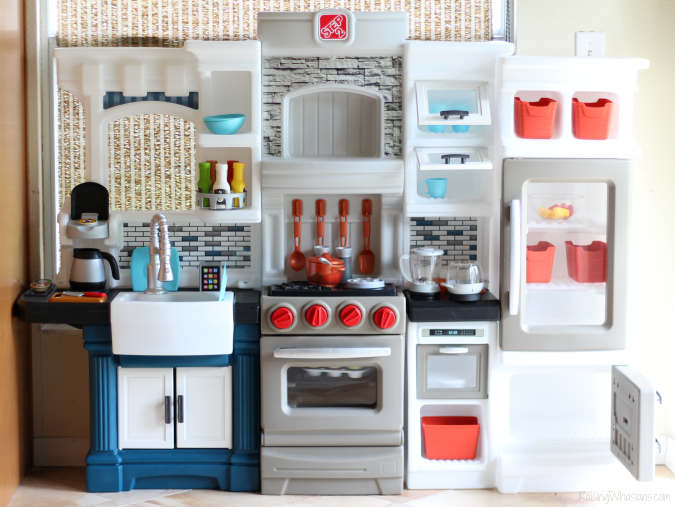 Plus check out the new Step2 Grand Luxe Kitchen in this exclusive toy review. This post is sponsored by The Step2 Company as a proud Step2 Ambassador. All playtime opinions are my own. May contain commissioned links. To those that immediately read the title and laughed, it’s true. I still can’t sew. But I do love drinking tea. If there’s one thing that I love about my 3-year-old daughter right now, it’s how she LOVES anything fancy and girly. And right now, toddler tea parties are all the rage in this house. We recently received the fanciest play kitchen in the world from The Step2 Company, which meant we needed upgraded tea party supplies pronto. 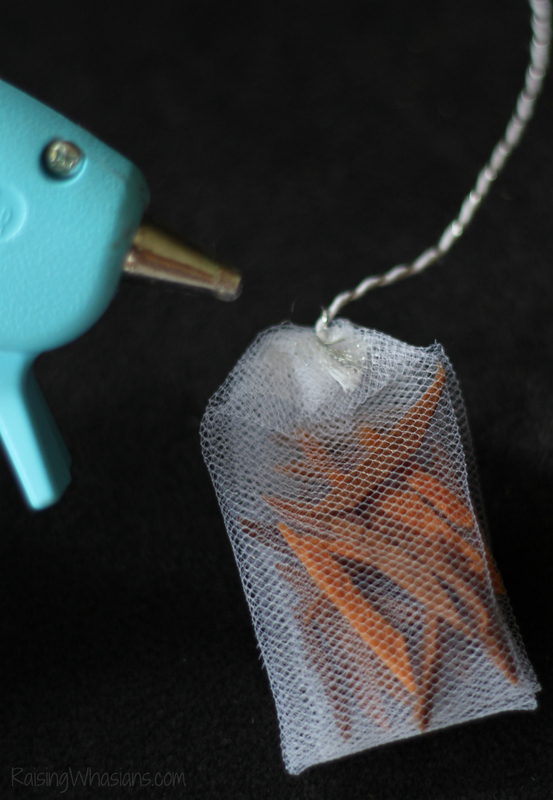 Check out why the new Step2 Grand Luxe Kitchen is even fancier than my own kitchen plus throw an extra fancy tea party with this NO Sew Play Tea Bags Tutorial. When a 70+ lb. box shows up on your doorstep, you know that it’s going to be serious business. The Step2 Company has been busy this fall with the latest and greatest play kitchen that has everyone talking, including us! With such a fancy kitchen coming our way, I knew that we needed fancy tea party supplies to keep up with this amazing kitchen play set. And that means that we needed lifelike play tea bags. 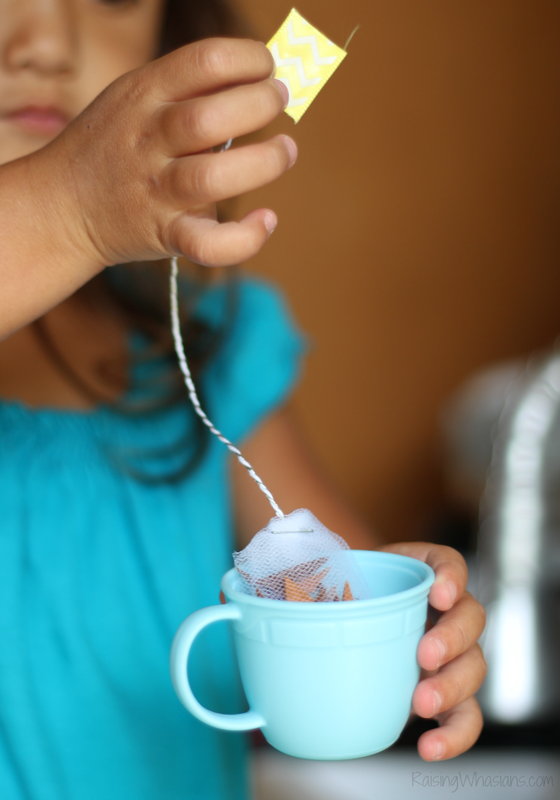 My daughter gets such joy out of steeping her tea just like mommy. I had to make her own set. But mommy doesn’t sew. 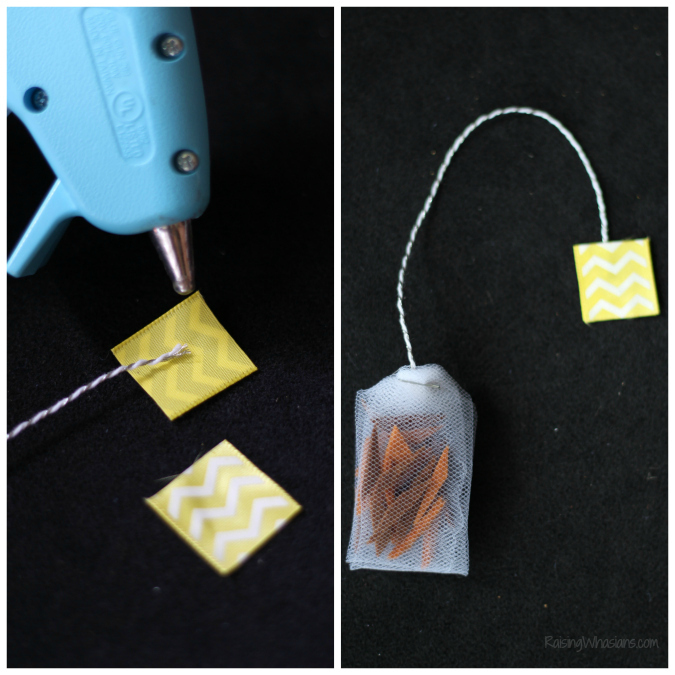 So instead, we got creative with this No Sew Play Tea Bags Tutorial. Cut tulle into 6 inch by 5.5 inch rectangle. 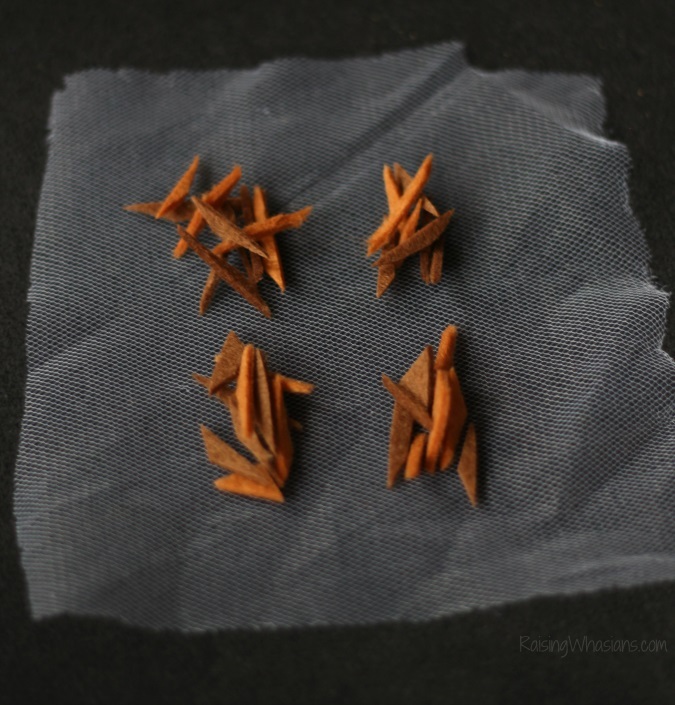 Cut felt into teeny “tea leaves” size pieces. 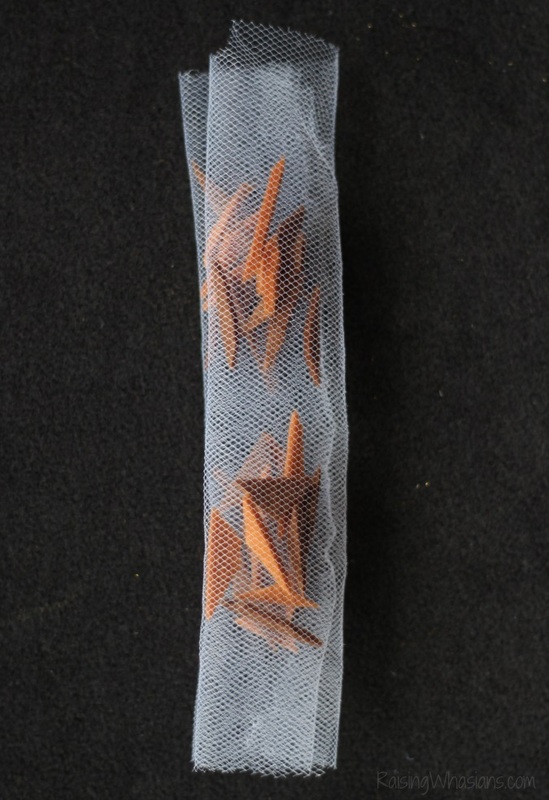 Place tea leaves inside of tulle in 4 equal piles as shown. 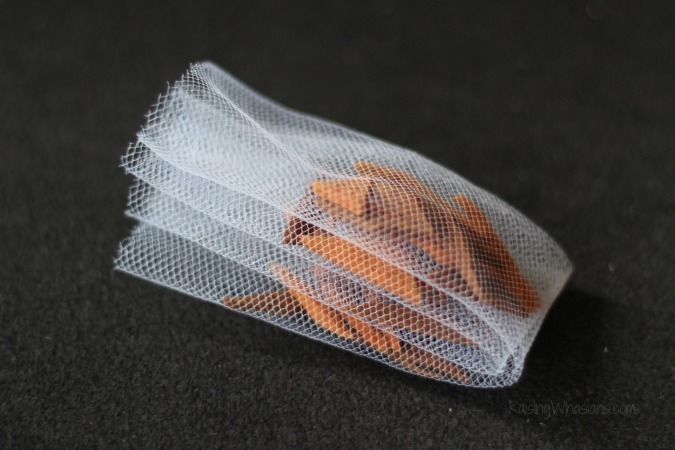 Fold in edges of tulle towards middle (lengthwise), so tea leaves are folded between layers of tulle. Now fold tulle in half lengthwise again. No open edges should be exposed. Fold the tulle in half horizontally, so the two open edges are seamed together. Fold the top two edges downwards – like a paper airplane – to form a point. 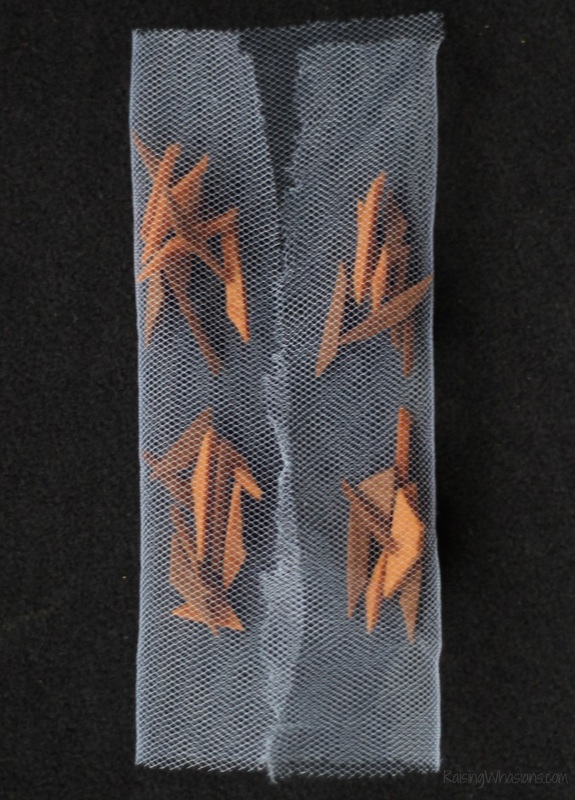 Half-fold the point down, so you have the top half of a hexagon shape on top of the tea bag. Place your string/twine in the middle of the fold. Turn over and staple. Because I’m OCD, I also encourage you to hot glue the back of the staple and string to keep from moving/fraying. Allow to dry. Cut two equal square pieces of ribbon. On the opposite end of the string, hot glue the string between the two pieces of ribbon. Dry. Now you’re ready to play! 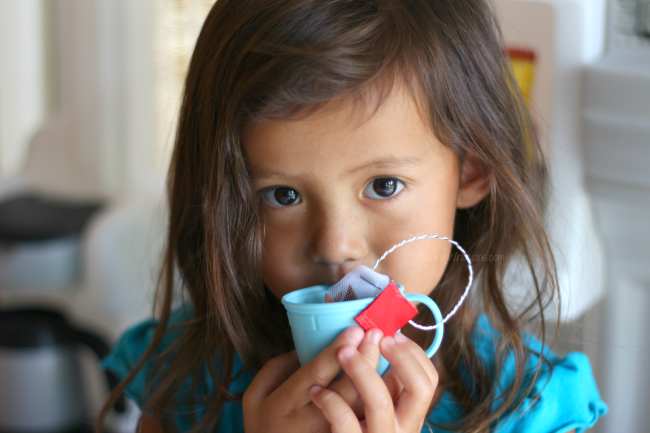 Let your child dip, steep and sip their “play” tea with their adorable new NO Sew Play Tea Bags. The perfect girly addition to a fancy new play kitchen. And speaking of fancy play kitchens, can I show you ours? 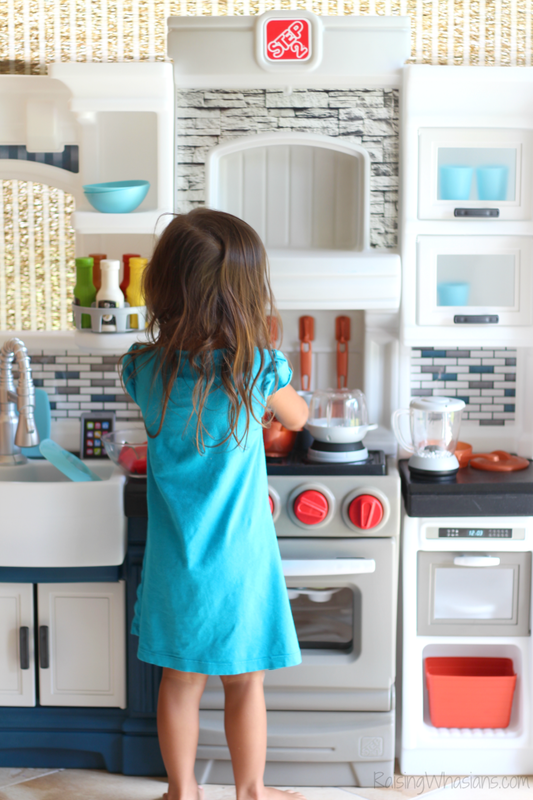 That moment that you realize that your child has a fancier kitchen than your own…I knew the minute that I saw this kitchen on my Step2 Ambassador Trip, that it was going to be life-changing for my toddler. Introducing the Step2 Grand Luxe Kitchen, your child’s dream kitchen (and let’s face it, mom’s dream kitchen too). Plenty of cooking space: This kitchen set easily allows multiple children to play at the same time. Working Lights: This kitchen comes with real working oven lights and refrigerator lights. So fun! K-Cup Coffee Maker: Who loves coffee? I do! My child loves pouring me cup after cup with her very own Keurig-style coffee make, complete with a set of mini K-cups. Storage! We cannot get enough of the extra cubbies, cabinets and spots for us to hold extra food, dishes and supplies. There’s definitely plenty of space here to hold all of your child’s dream kitchen essentials. Lots of accessories: 78 of them to be exact. Enough place settings for 2 (cups, coffee cups, plates, bowls, and utensils), pots, cooking utensils, mixing bowl, baking cupcake set, blender and popcorn maker. Includes fresh fruits and veggies too with built-in velcro so your child can “cut” them again and again. The Step2 Quality: As expected, Step2 comes through again with a high quality, durable toy that is an investment for years to come. You’ll need a lot of space. This kitchen play set is larger than most play kitchens, about 5.5 feet in length, 50 inches high and 14 inches deep. Stock up on batteries. You will need a total of 11 batteries to get the full use of all of the features: 5-AA & 6-AAA. Give yourself plenty of time for assembly. This large kitchen took me about 1.5 hours to assemble, parts of the time with another person to help. If you plan on giving this kitchen assembled as a holiday present, make sure you block off enough time to put everything together beforehand! Cost. It’s a big ticket item. Available exclusively at Toys R’ Us, this Step2 Kitchen is a seriously little child dream come true. At an MSRP of $349.99, I totally understand how this can be of concern to parents. But if you’re looking for the high quality toy for years worth of play – it’s an amazing investment. This would be the perfect family gift – to get the grandparents, aunts, uncles, moms and dads to go in together for that one amazing gift. Want to see this FUN toy in action and get the full scoop on why this toy is going to be HOT for the holidays? 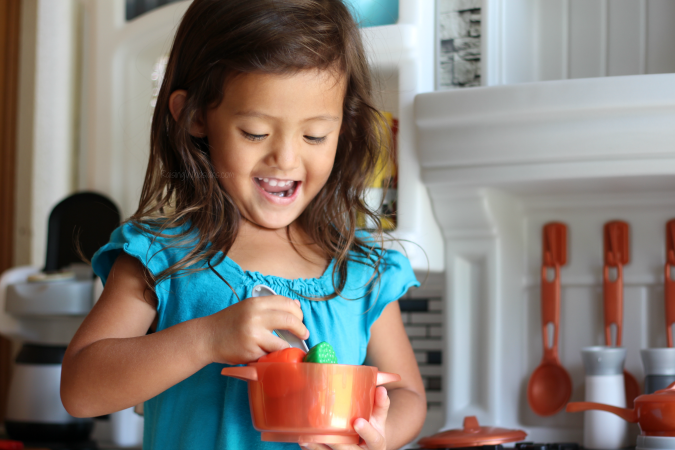 Check out my full video review (and a sweet little girl in her element) of the Step2 Grand Luxe Kitchen. The sounds, the lights, and the giggles! Needless to say, my daughter plays with her kitchen Every. Single. Day. It’s amazing. And when it’s situated right next to my kitchen, she can cook right alongside mommy. And I hope you’ll take a look at all of the fun that we’re having as a Step2 Ambassador on the blog – from parties to car washes to crafts and more! 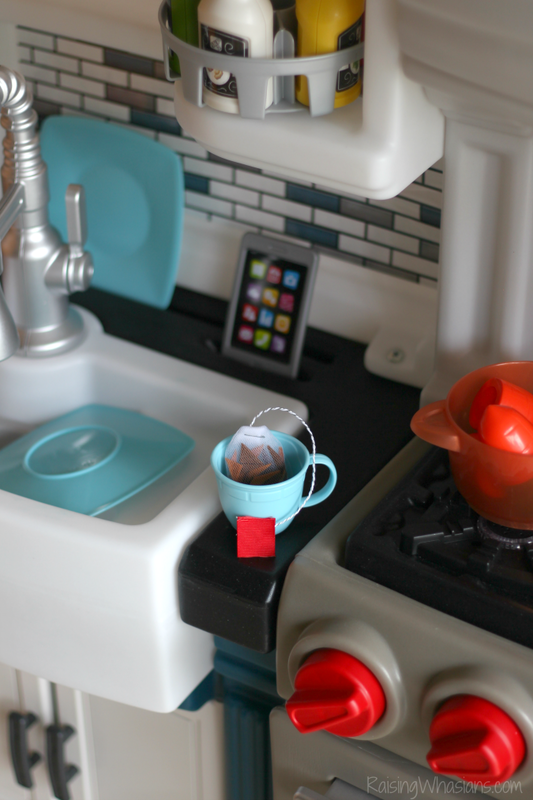 In case you’re looking for us, we’re steeping and sipping tea in our new Step2 Grand Luxe Kitchen. Hours of imaginative play at work, we are in love with the newest play kitchen from The Step2 Company & these adorable No Sew Play Tea Bags. What do you love about the new Step2 Grand Luxe Kitchen? Be sure to follow Raising Whasians via Facebook, Twitter, Google, Instagram, Pinterest and YouTube for more kids craft ideas, family recipes, travel tips and more. I love those! Little touches like this can make play so much more fun for the kids. That is totally adorable. This adds a completely new level of imagination to the party. Love it! What a great and creative idea. I will have to make some for my little niece. She loves to throw tea parties for me. What a fun idea for a play kitchen. My daughter always wanted to have pretend tea parties so this would’ve been perfect. What a unique and fun pretend accessory idea! My kids all loved their play kitchen growing up and sweet little touches like this would have really set their experiences over the top. Oh this is so neat. 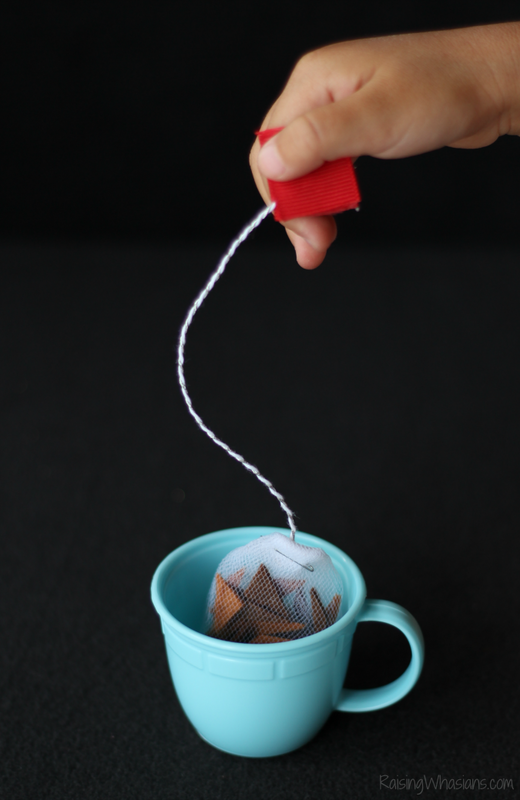 I’d love to make some tea bags. That Grand Luxe kitchen is amazing. That’s such a good idea! My daughter would have loved this when she was younger. I will have to make these for my friends little girl. She just got a tea set and would love these tea bags. Ha! Such a cute idea, and one that completes the kitchen! She can serve you from her ‘own’ kitchen, and really have an accessory no one else has. Love this idea. Simple, quick, and it looks realistic! This is so cool! 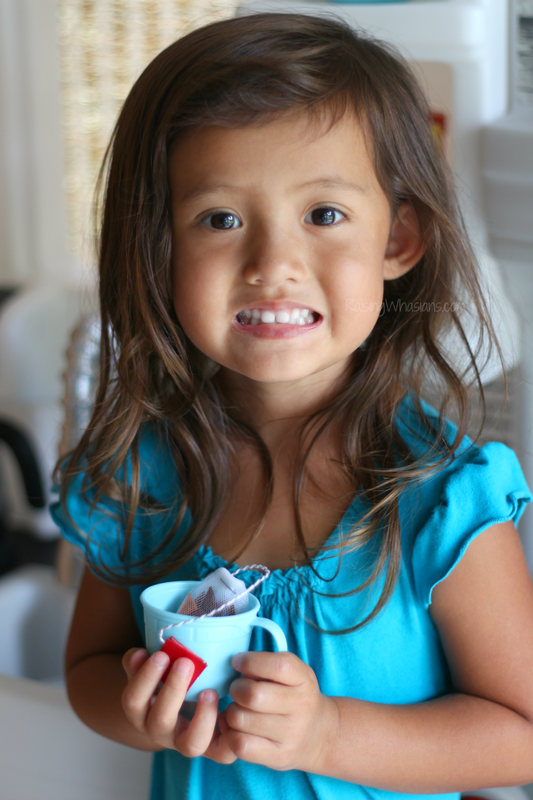 I love the idea of easy crafts for kids! Your daughter’s little kitchen is so cute! 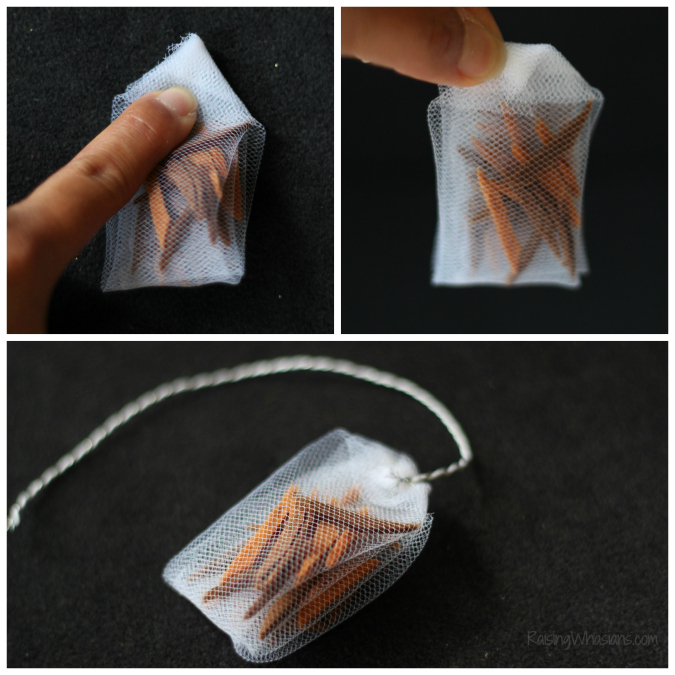 Those no sew tea bags are absolutely genius!! I can’t wait to make them. This is something I can actually do! That kitchen is amazing too! The investment is totally worth it because the kids can play with it for years and it lasts! My kids love playing kitchen, boys and girls alike! Wow, what a wonderful idea! I like your mini kitchen, I bet your daughter loves playing there! I’m so in love with this DIY, my girls would flip! Definitely going to be making these this weekend! Our son would love a kitchen like this. You’re making me wish I know WhereTheFrenchToast my stapler is. 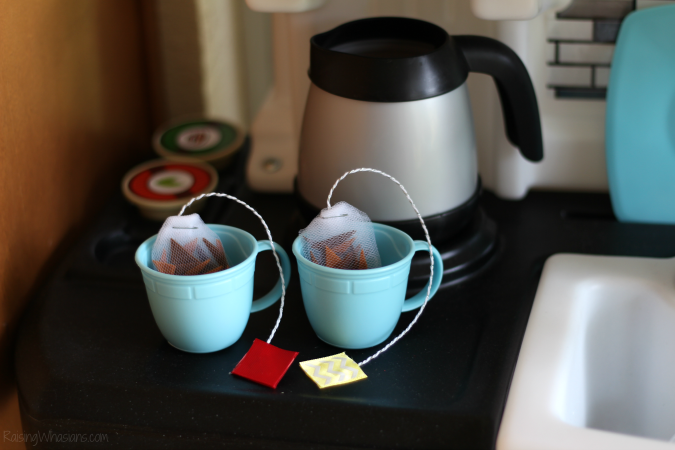 This is so adorable and just about the cutest tea craft I have ever seen! I wish kiddo was young again just so I could make some of these for her. What a cute idea. We host a gift assistance program around Christmas time and are always looking for new ideas for easy gifts. This one looks perfect! Thanks for sharing. What an adorable idea! My son is always pretending to drink tea with me, and now he can have a little more fun with this! His best friend next door has a play kitchen, and I know she would love this also! What an adorable idea! These are super cute! Love this idea! My daughters are going to love this, they always want to be like mommy with tea and we’re always missing the tea bag for their pretend play. Thanks for the tutorial! EEEP! This is honestly the cutest thing I’ve ever seen! 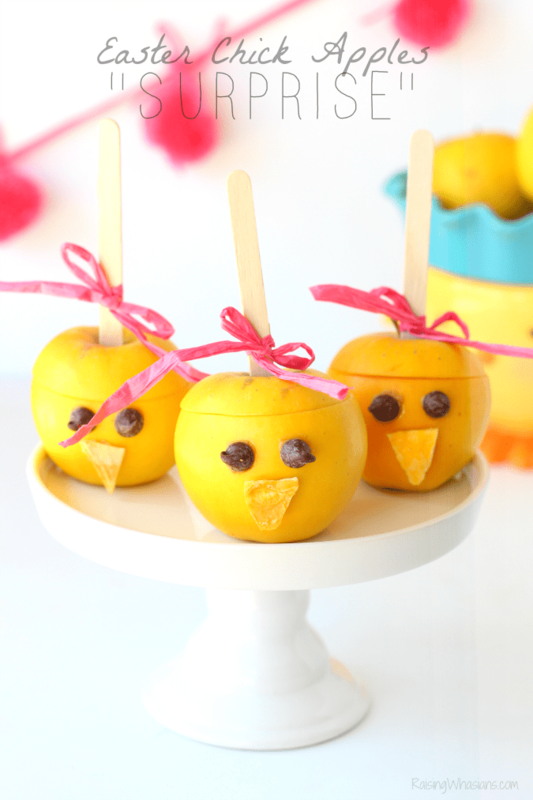 My little one isn’t due for another 30 days but I’m pinning this for when she is older so I can make these. 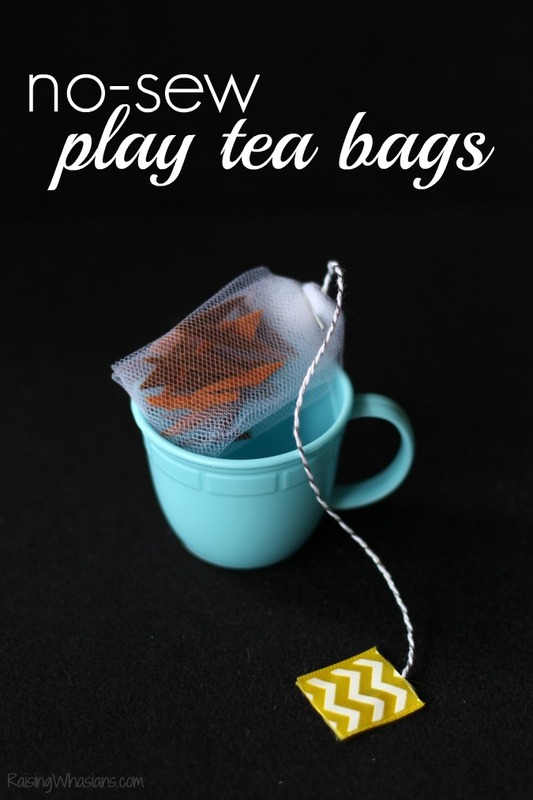 This is such a cute idea, I wish I had thought of this,I am going to make a few of these for the girls, they are always asking to have tea with me. I love these, how adorable and easy. Thanks for sharing, perfect for Teddy Bear Tea Parties. LOVE this!! So fun!! I am a huge tea drinker so I bet my son would adore these for his little kitchen! !